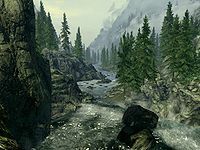 White River is the longest river in Skyrim, stretching from the south of the province to the northeast corner. The source of the White River is Lake Ilinalta, north of Falkreath. It flows northeast to join the Sea of Ghosts past Windhelm. Along the way, it passes through Riverwood and near Whiterun. Darkwater River and River Yorgrim are the two main tributaries of the White River. This page was last modified on 25 September 2012, at 21:26.